New York à la Keiko: nykeiko eats: A nice quiet dinner at Adler [NYC] + meeting Wylie Dufresne! 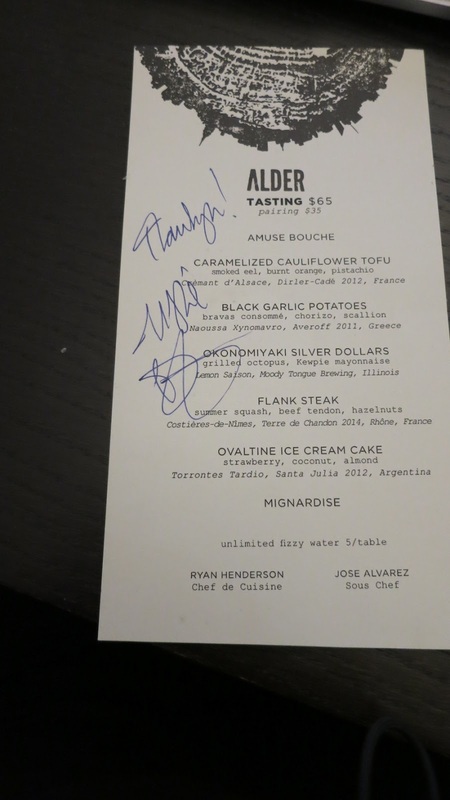 nykeiko eats: A nice quiet dinner at Adler [NYC] + meeting Wylie Dufresne! The idea of a romantic dinner for two in New York means taking your loved one to an old stomping ground where you know the food is always good orrrr you take them somewhere new and hope for the best (but know it's good food because all the food critics and food bloggers gave it a thumbs up). 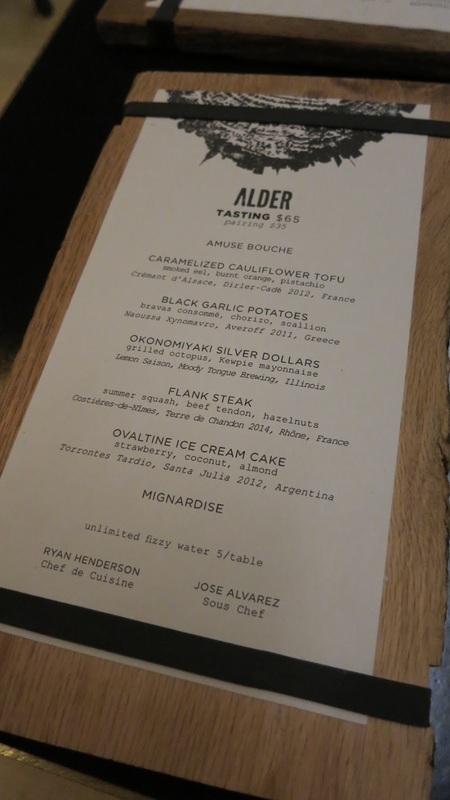 For our wedding anniversary dinner, Dave made reservations to Wylie Dufresne's Alder in the Lower East Side. "We celebrated our engagement at WD-50 so I thought it would be appropriate to celebrate at another of Wylie's restaurant". The chef's highly praised WD-50 closed its doors in 2013 and Alder is Wylie's "new" baby. Dave mentioned Mr. Dufresne is helping his dad open a sandwich place so maybe we can celebrate year 3 over there! I don't need fancy, I just need gooood food! But Wylie made it clear that this is his dad's project and not his! It was not difficult to get reservations for Alder which made Dave worry a bit. Maybe it's not good anymore?? Could be since restaurants in New York are generally hard to book at decent times if they are exceptionally delicious. It's okay. We can't knock it until we try it right? Right. So, verdict? Yumsicles! (I've been saying this a lot and have no clue where i got it from!) We tried the $65 five-course tasting menu and not the bar menu the restaurant has come to be known for (bar menu includes "pigs in a blanket", burger, pasta and more). Sure there was one or two plates that were okay (we weren't a fan of the caramelized cauliflower tofu thing) but I enjoyed the amuse-bouches (a yummy asbinthe cured foie gras mousse on top of some falaled cheez-it?!) and the black garlic potatoes in a salty consommé. Alder has a very casual setting which made it a relaxed meal for us. It was very quiet on a Sunday night. No reservations necessary. In the dining room, the only option we had was the tasting menu so we didn't have to use our brains too much on deciding what to eat. Just let your waiter know if you have any dietary restrictions, if you'd like the wine pairing with your meal ($35 extra) and note that there's also unlimited carbonated water for $5. Thank you for making our two-year anniversary extra special with your kindness!